Hard to believe it’s been four years since I attended my last Carnage Con, but I was finally able to make it again this year. As an added bonus, I had my son in tow this time. For those that don’t know, Carnage is an annual convention that takes place at the Killington Ski Resort in Vermont. The location is as beautiful as it sounds. 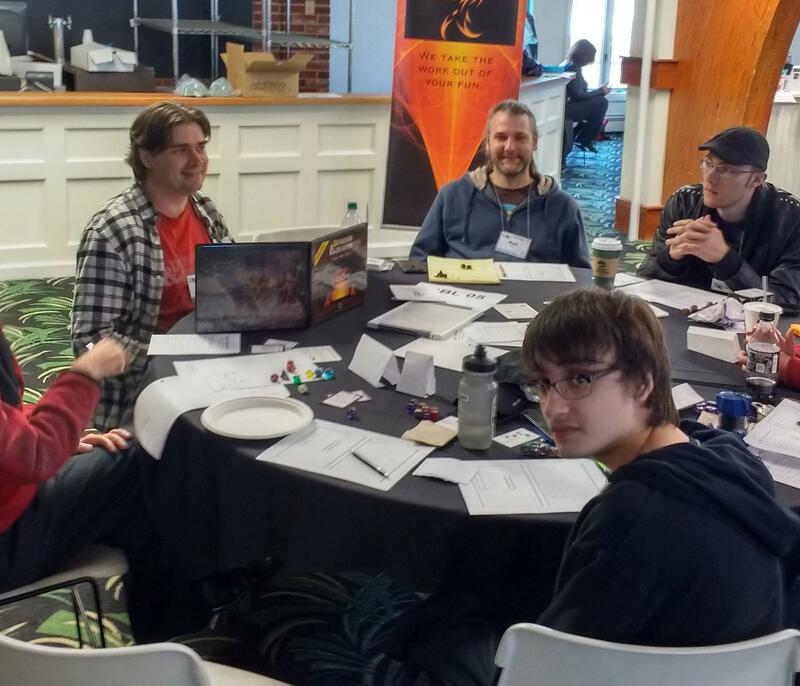 I didn’t have time to play as many games as I did the last time I went, but I was able to get in two OD&D sessions, run by Paul of Paul’s Game Blog (he has his own report of the convention). He uses Delta’s OD&D houserules and keeps things moving along – he is obviously an experienced old-school referee and we had a blast in both games. My son commented afterwards how much fun the games were, and how different they were with a lot of people (he is used to playing games with me and his sister, so the second game with seven players was an eye-opener for him). In our first game all of the pregens were around 6th level and we were exploring a tomb that contained various traps, the usual undead critters and a vampire. I ran a Halfling fighter with an intelligent sword, my son an Elf magic-user. A fun moment was my son trying to decide if his magic-user should cast a lightning bolt against another player who had been charmed by the vampire and was intent on attacking us. In the end he attempted to aim at just the vampire, but missed and caught both of them anyway. In the second game all of the PCs were around 2nd level, and we explored the first and part of the second level of Dyson’s Delves. Again my son chose a magic-user, making good use of charm person against the goblins. My own Elf fighter was beheaded by the Hobgoblin king on level 2! Good times. As for the house rules, I’ve come across Delta’s site before, but have not used his rules as a whole or the target-20 system to adjudicate combat. I have a newfound respect for both, and I’ll definitely be stealing some ideas for my own OD&D games.